Our closet is done! Well, pretty much. We still haven't officially decided on trim/moulding for the window and door, but other than that, it's done. We've been moving all our clothes in over the past week, little by little, and organizing everything so that it was a clean, happy place to be. I've even gone as far as organizing my clothes by color, and bought nice, lighter colored hangers online. Once my side of the closet was all pretty and organized, Josh looked at his mix-and-matched clothes on dark hangers and was like, "Can you make mine pretty, too? My side looks sad." So pretty hangers are on order for him, and once they arrive, I'll be organizing Josh's side to look a little happier. But for now, this is what we have. Let's do a true before and after, mmmkay? There are still some little touches I'm waiting to add, but I was able to get some small homey things in the space for the time being. I ordered some wintery evergreens and dusty miller sprigs from AFloral and put them in a white ceramic pitcher for a little something on our window sill. I also ordered some white anemones for this arrangement, but they haven't arrived yet. Sad face. Because the sloped ceilings go up well past my own height, we needed to have a step stool handy for the rare occasions I would need to actually reach the top shelves. I found this cute little stool on Overstock and put a little lantern* from Pottery Barn on top. 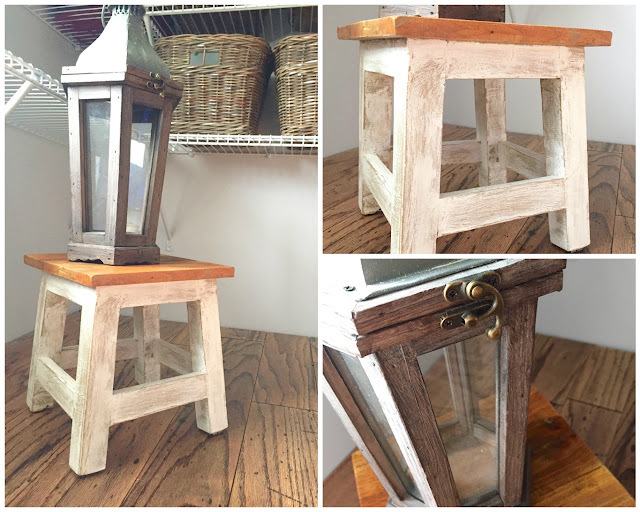 I plan to fill the lantern with some wintery cedar greenery and a candle (and change it out seasonally), but I haven't quite gotten there yet. 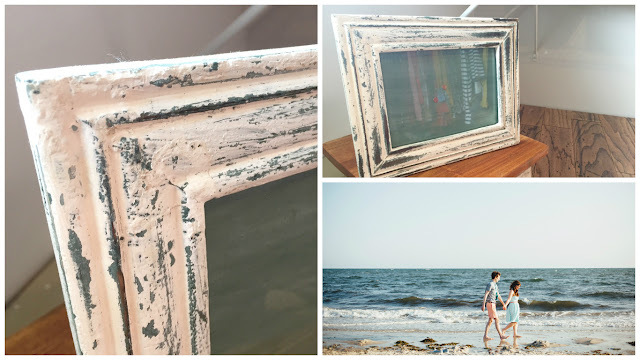 We also plan to hang some photos on the walls, but in the meantime, I found this little frame at Michaels and thought it was perfect for one of our Cape Cod photos that was taken a few years back. I have the print on order, but it's not here yet, either. And finally, as ridiculous as this sounds, I ordered new hangers for my side of the closet. I asked Josh if he wanted me to order him some new hangers, too, and he looked at me like I was nuts and said no. I ordered myself Huggable Hanger knock offs on eBay in an ivory color that better suited the lighter and brighter space, and seriously, it made such a huge difference in comparison to the black ones we had. So much so that Josh had me order some for his side, too. 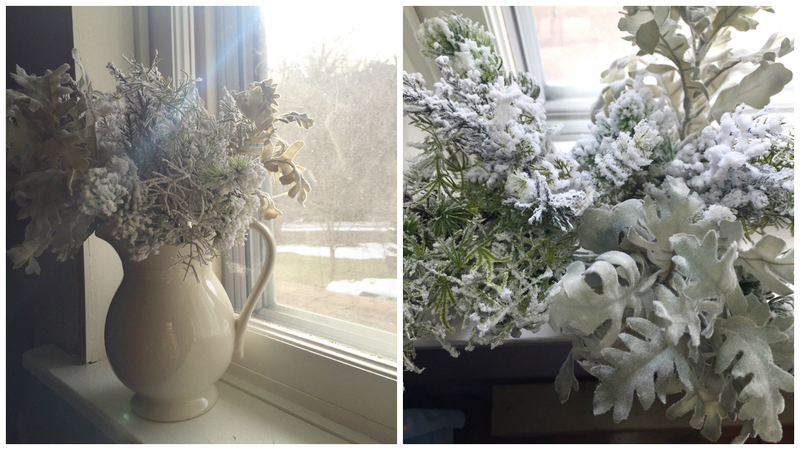 L: Dark and dreary; R: Happy and bright. Work on our next project begins this weekend! We're going to start working on our bedroom hallway. 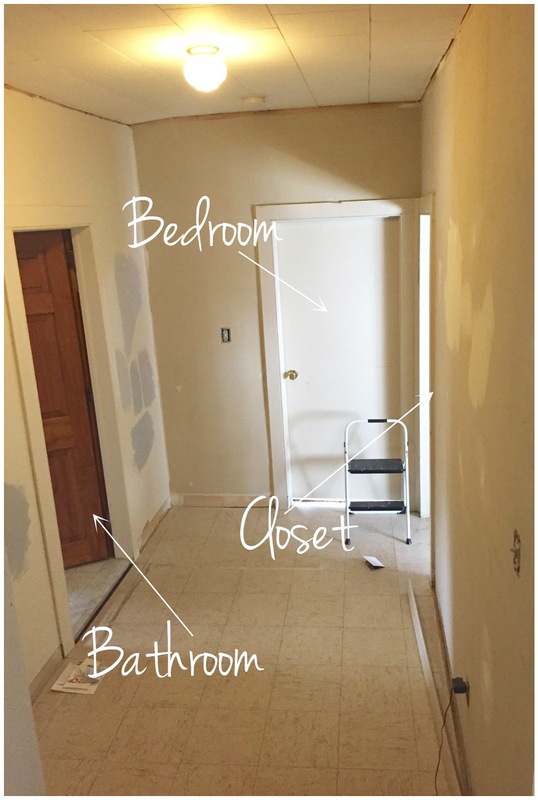 Most people are confused when I say "our bedroom hallway," so let me explain. When you get to the top of our stairs leading to the second floor, immediately to the left is the entrance to our bedroom. To get there, you have to go down about two stairway steps into this space, which leads you to our bathroom, closet and bedroom. *I work for the Williams-Sonoma brand and received a discount on these items. 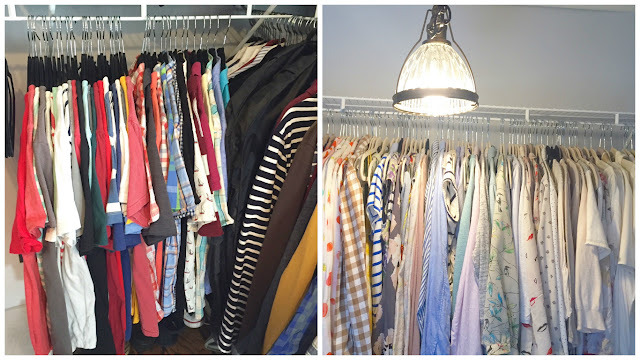 Our Master Closet, (85%) Done! Oh hey, we have a closet now! While it's not 100% done, we're almost there. It's functional, it's been primed, painted, spackled, nail gunned and organized and it's a huge improvement from what it looked like before. So let's rewind a bit to the beginning of the project, shall we? When we moved in, this room had vinyl wood paneling on the walls, linoleum floors, an institutional tile ceiling, chunky oak cabinets and wasn't set-up for a hardwired lighting fixture. 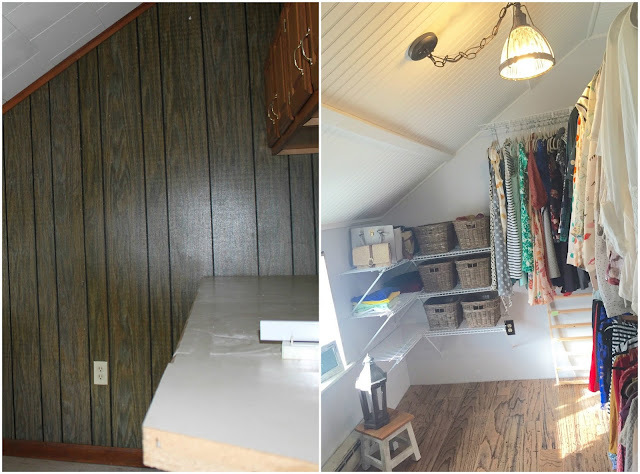 It was a small, dark space that had a lot of potential for a very lovely, cozy little walk-in closet. Our first step to transforming the space was taking out the cabinets. That opened up the room a ton. I was already feeling better after this minor accomplishment. Next, removing the wood paneling. We went back and forth on this a lot, actually - keeping it up and painting it, or taking it down. The drywall underneath it was in really good shape, so we just went for it one day and hoped for the best. 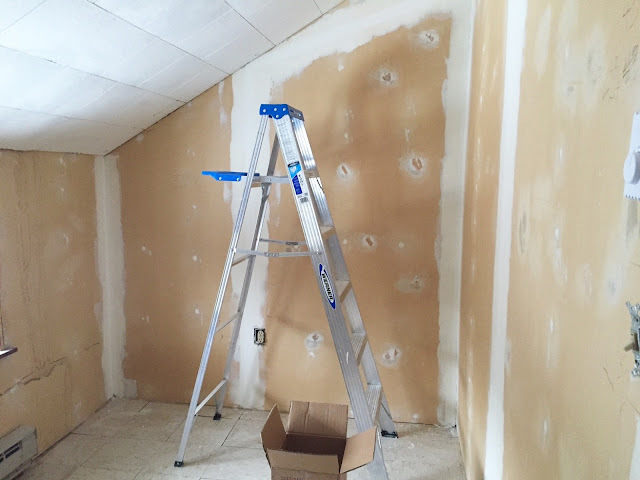 For now, we're living with the paneling (that's been painted) downstairs because we have crumbling plaster walls underneath, so in our bedroom and closet, we both agreed it was a waste to hide perfectly good drywall. We tore down one sheet, and did a test run by sanding down the adhesive and spackling any uneven surfaces, and it turned out better than we expected! So down the rest of it came. After this was done, we had an electrician come in to hardwire the ceiling for a light fixture. The room had a light switch by the door, which controlled an outlet, but we really wanted to have a ceiling light to save space on the floor, and also not to have to build our shelving around a big floor lamp. The next part was probably the hardest. 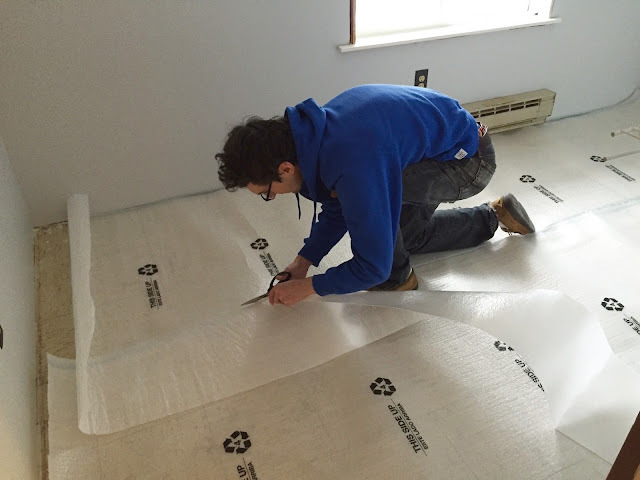 Josh took on jointing the drywall himself. And he did such a great job. I'm a proud little wife! There's one strip that came out a little bubbly, but other than that, you can't even see the taping under the paint. Paneling down, joints taped and feathered and cabinets gone! Then it was my turn. I came in to prime and paint the walls. I don't normally prime walls, but in this case because of everything they've been through, I felt it needed a good base coat. One coat of primer, and two coats of paint, and we were ready to tackle the ceilings. 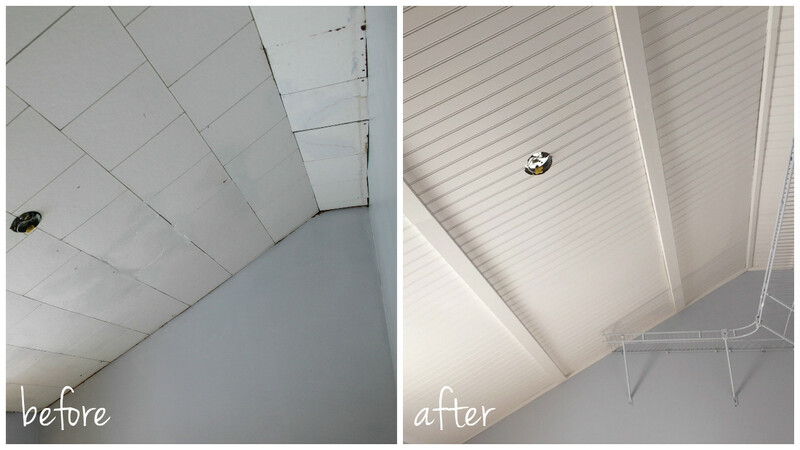 Painted and ready for a new ceiling! Our original plan was to use wood planks for the ceilings of our master hallway, closet and bedroom. But, because our hallways and closet are, shall we say, daintier, more petite spaces, we decided to do beadboard ceilings instead, and reserve the planks for our bedroom. Not a decision everyone will love, but it's what we're happy with. Installing the beadboard was an ordeal for these two amateur DIY'ers. 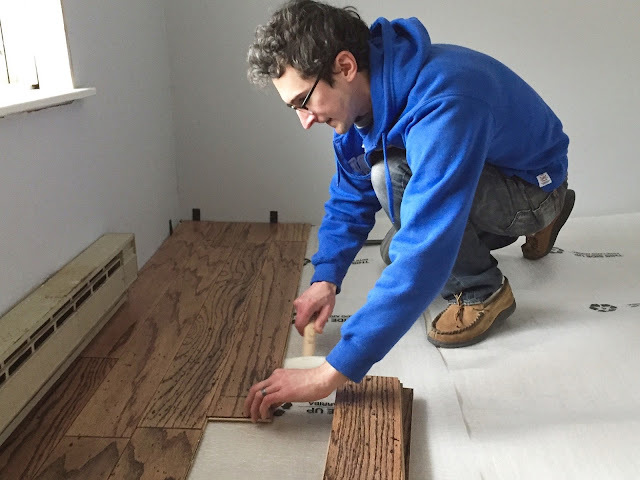 I was hesitant to do it ourselves, but Josh was confident we could tackle it, even if all I did was assume the role master beadboard holder (which is totally what I did). Putting this stuff up was still challenging. 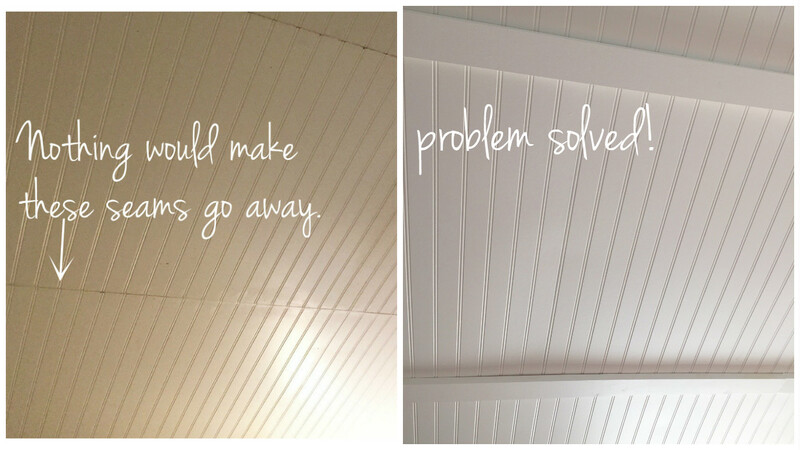 Because of the linear nature of beadboard, the panels needed to perfectly line up. And because this house is like, really old, it's not at all even. We put up and took down the first pieces about five times, and each subsequent piece came down a few times, too, to make sure they were as even as they'd get. It was very tedious. 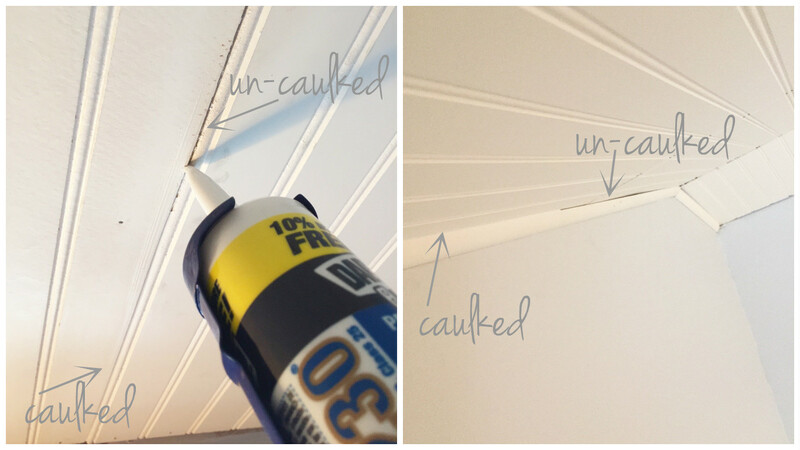 Once the beadboard was up, I graduated from master beadboard holder to beadboard caulker. 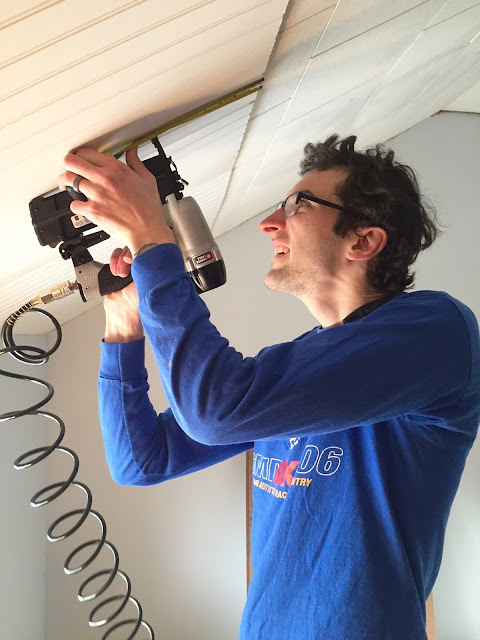 We used smaller beadboard pieces because one, we have a small car, and two, it was just the two of us holding them up to the ceiling to install, so they couldn't be really big. That said, there were a lot of seams to hide, and a lot of nail holes to fill. I hated about every second of this step. 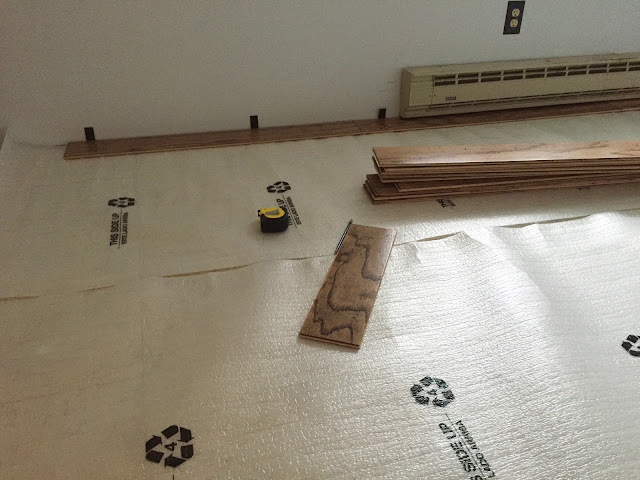 Once we started to caulk the vertical seams, we realized that hiding the horizontal seams was near impossible. The cuts of the pieces were just too rough, and after testing different techniques out, we realized you'd always be able to see them. So, I decided to put up little wood beams to cover them, and what do ya know, it actually added a cool element to the space that made it a little more barn-like and visually interesting. It was a project fail that turned into an unplanned pleasant surprise (a first for us!). 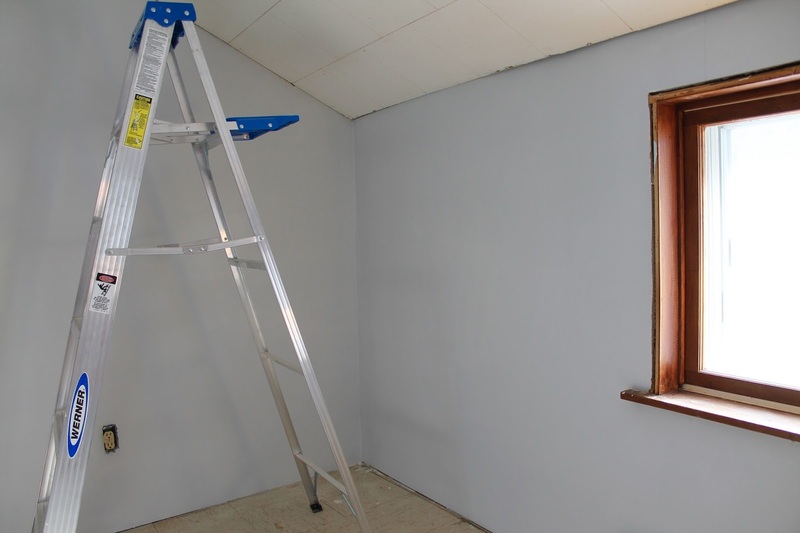 Once the beams were primed, painted and installed, it was time to paint, and put up the rest of the trim. You can read about my awesome meltdown over the trim here. Professionals would definitely have done a better job, but considering this was our first time, and considering that this room is a total oddity in shape, size and general symmetry, I think we did a bang up job, if I do say so myself. There are totally some weird seams and "Ohhhh, um, we can just caulk that" areas, but live and learn, my friends. Live and learn. 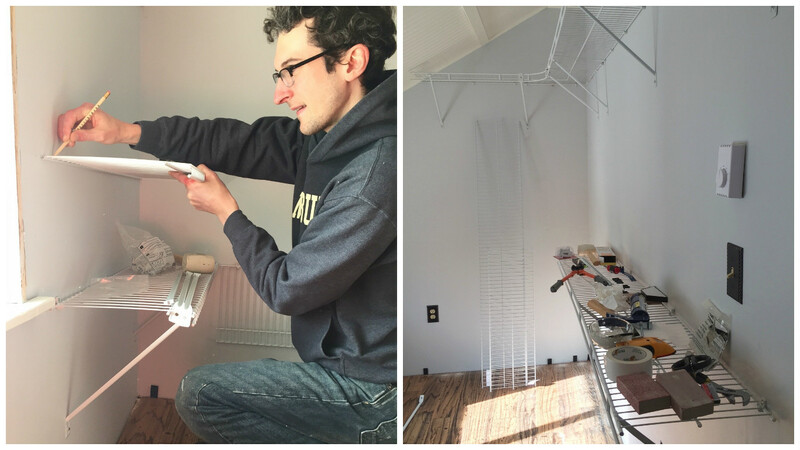 Next, we installed the shelving. While it would have been amazing to get a super fancy custom California Closet with wood cabinets and drawers, it just wasn't enough of a priority right now, seeing as though we have a bathroom to install in the Spring, as well as a pretty big bedroom to finish. Someday, maybe in like 10-15 years, I hope to get something like that to really maximize our space. 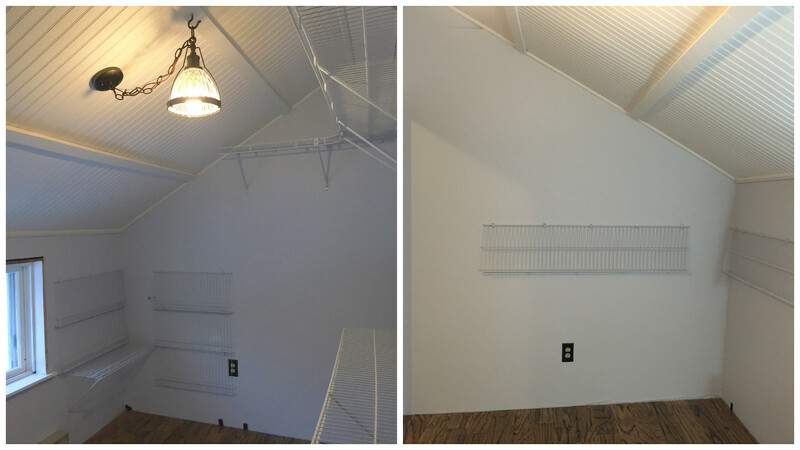 But for now, we have the white wire shelving units. Which honestly, I don't really hate (although I know most people do). The shelves made for a nice tool storage area, too! And then, THEN, it was time for the floors. We bought the floors months ago, thinking that's when we'd be ready for them (ha!). 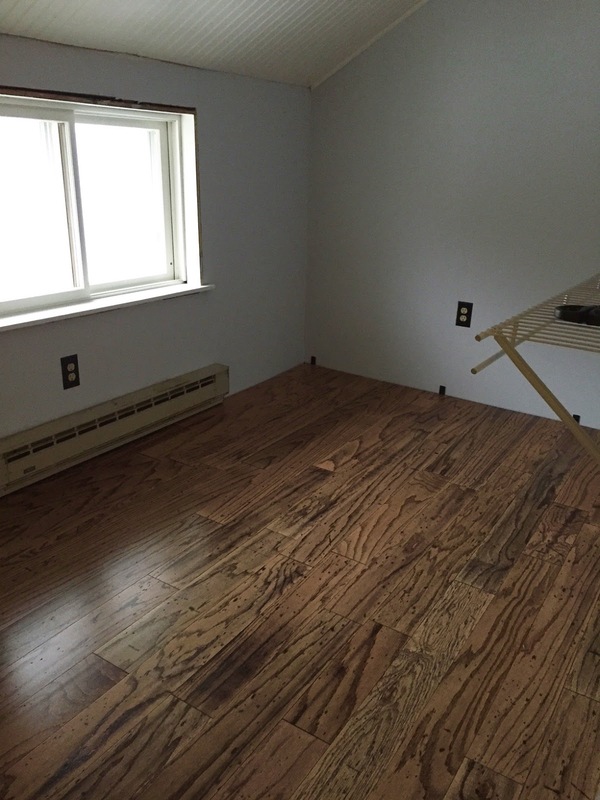 We decided on Manufactured Engineered Hardwoods for a variety of different reasons, and ended up choosing flooring by Bruce in a distressed oak finish that looked old and weathered. The floor installation took Josh only a few hours, and once it was in, we just stared at the room for about five minutes in disbelief that we actually had a closet with a real floor. Finally, we installed the light fixture. The placement of the light isn't ideal because of the sloped ceilings, and the general height of the room. Josh is 6'3, so we had to hang it high enough so he wouldn't hit his head on it every morning. Sure, we could have done a flushmount light so we didn't have to worry about this, but I kind of had my heart set on this pendant light from Birch Lane. And, we were able to get it at open-boxed pricing (which offered a steep discount) plus an extra percentage off for their Black Friday sale, so it was meant to be, right? 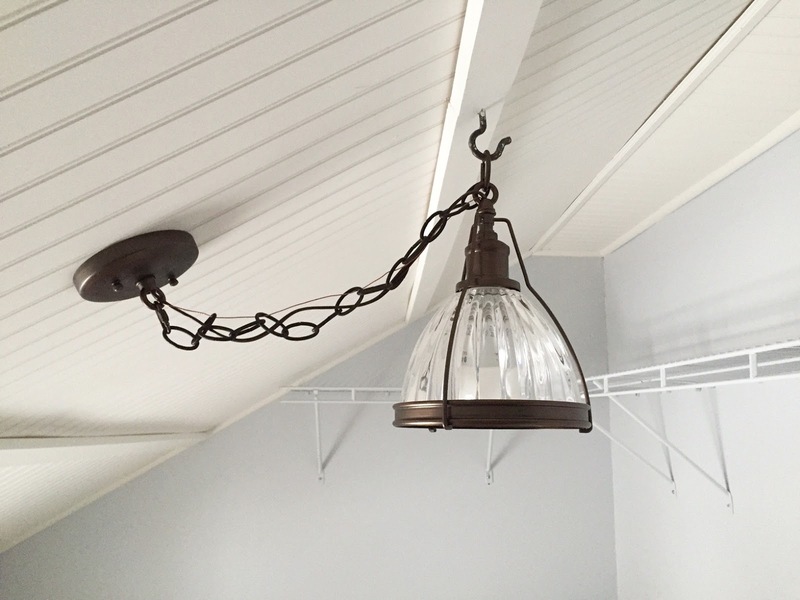 Rather than using the pole extension it came with, we decided to add a chain to hang it higher up on the ceiling. Using the wall-mount piece in the middle of the room where we had the hardwiring placed, and a hook to where we actually wanted the light to hang from, we finagled the light and the chain to make it work. It's a little odd looking, but so is the whole room, and I'm all about weird quirks in old houses, so I'm rather thrilled with it. We have to touch up the hook a little because it got banged up during installation, but that's an easy weeknight project. And that, my friends, is our closet (mostly) done. We still need to install our window, doorway and floor trim, and the shelving brackets (because oops, we forgot to buy them this weekend at Home Depot) but it's exactly how I envisioned it, and I'm so glad that we did everything ourselves. I've been so happy to have one space in our house exactly as I want it, that I've been splurging on a few decorative and totally unnecessary things to spruce it up and make it even more homey in here. I'll share the details next week with a complete before and after. You know you're (maybe, kinda, sorta) excited. 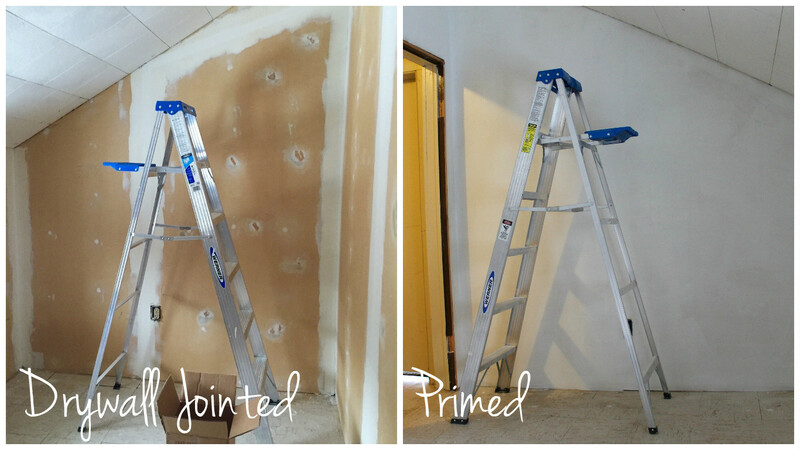 Last night, I had my first "Renovating is just so haaaaarrrrrdddddd!" meltdown. While we've run into a LOT of issues with projects in the past almost-seven months, I've always been able to keep my cool because it's still a lot of fun and rewarding. But last night, when we were trying to finish the moulding in our closet and it just was not working I thought to myself, "We can't do this." We had messed up parts of it already, and had to backtrack a little, and there were other hiccups along the way with our corner cuts not aligning and the uneven walls causing gaping. So last night, when the moulding still wasn't working, I walked away and expelled a very dramatic, "I just can't even!" But waking up this morning, and having the floors just WORK totally made my day. They were done in about two hours and we were able to finish some of the moulding (some, however, we need to buy more of again but it's fine). Why is it fine? 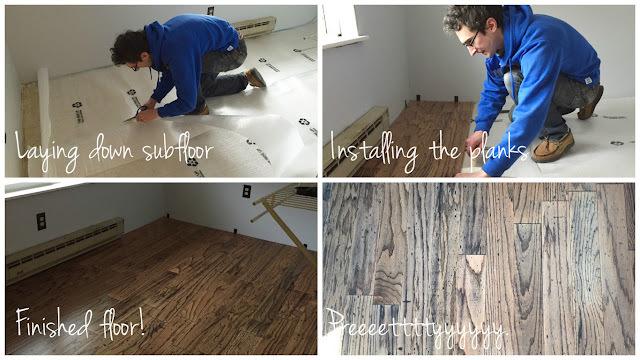 Because our floors are so preeeettttyyyyy. During the week, I caulked, spackled, sanded, primed and painted the ceiling that we installed, and we spent the weekend installing a test shelf unit, having meltdowns over the moulding and putting in the new floors. Here's some photo documentation until next week, when we hope to have our ceiling beams up, new light installed and shelving pretty much done so I can move in! Once we finished our kitchen, we thought we'd have our master suite, which includes a little hallway, bedroom, and this walk-in closet, done before Thanksgiving. Done, as in paneling stripped down, drywall jointed, primed, painted, floors installed, new moulding and trim installed and shelving put up - all by Thanksgiving, in all the rooms. It's now January, and just our closet is kind of, sort of on its way to being done. Currently, my clothes are split between three bedrooms in our house: The bedroom we're currently sleeping in (not our master bedroom), our office and our guest room. My dresser in one room, and hanging clothes split between the other two. Picking out clothes for work and, you know ... life ... is kind of an ordeal. So having this one space for everything is like, a huge motivation right now. 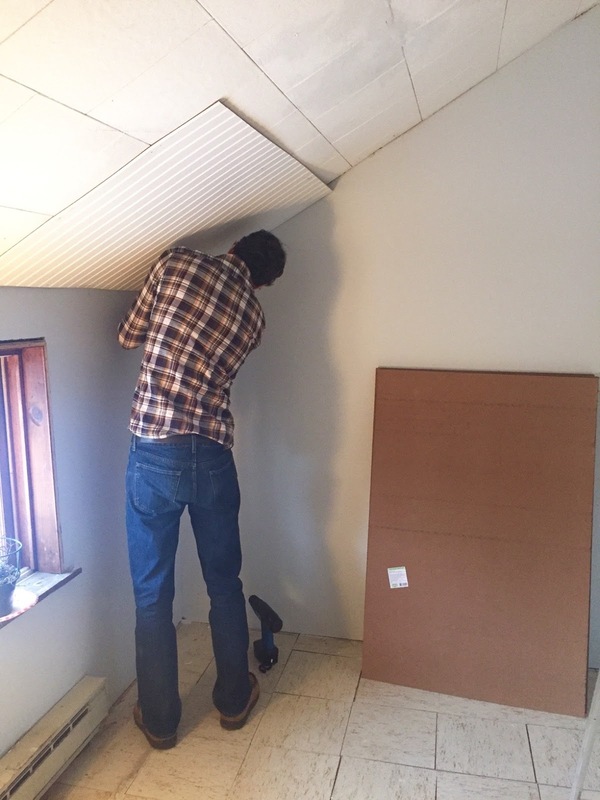 Starting New Year's Day, we began work on our closet by creating a floor plan for the shelving units. 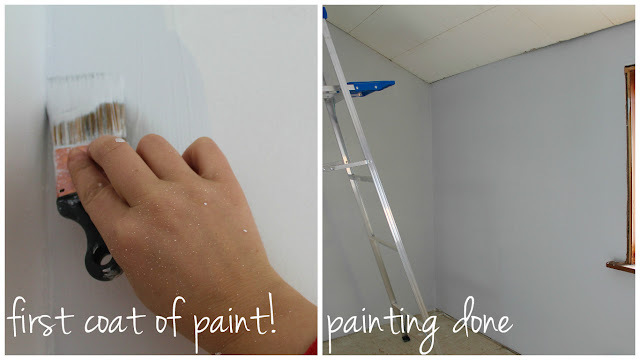 The next day, we bought them at Home Depot, and the day after that, we primed and painted the walls. That alone made such a huge difference! 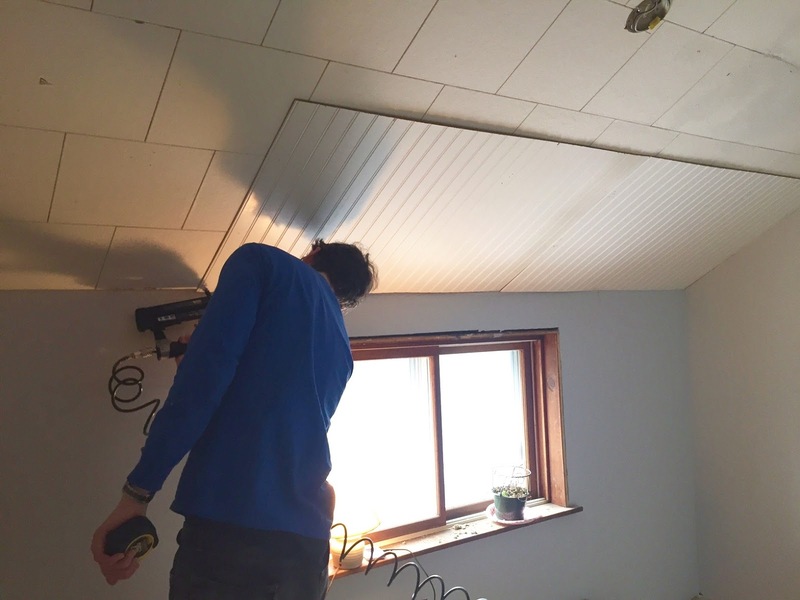 Then today, we started to install a new ceiling. 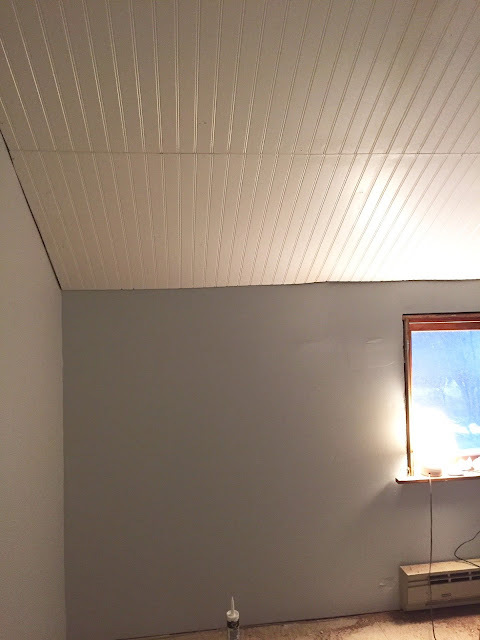 Last weekend, after painting, we scratched our original plan of putting up ceiling planks and decided to go with beadboard (I'll go more into that in a future post). Yesterday, we started putting the panels up with a hammer and nails, and today, after much hammering of thumbs and swearing in general, Josh was at Home Depot when they opened at 8 a.m. and bought a nail gun. We're now in a much better situation, and there are a lot fewer F-bombs being dropped. 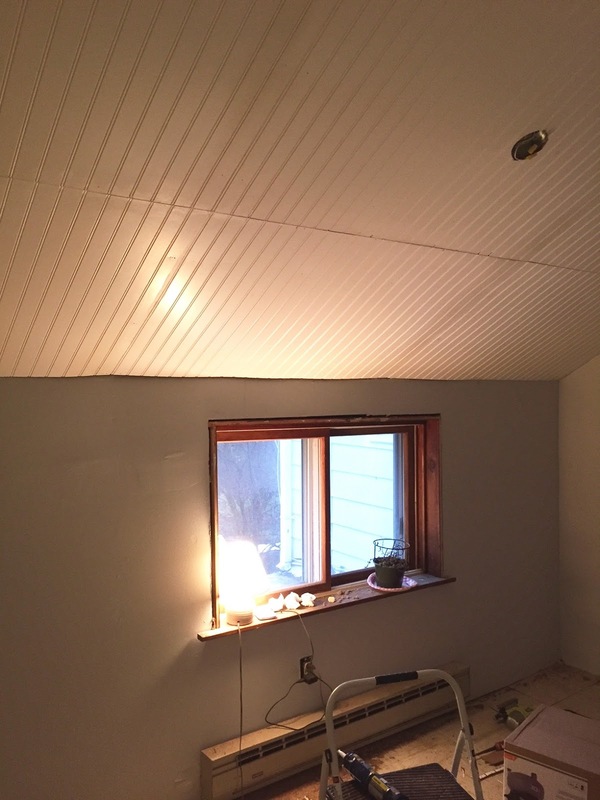 Hopefully, by next weekend, I'll be drinking wine in celebration that this ceiling seams are caulked, wood-filled and the whole thing is painted. But either way, I'm totally having wine because this shhhhstuff is hard. 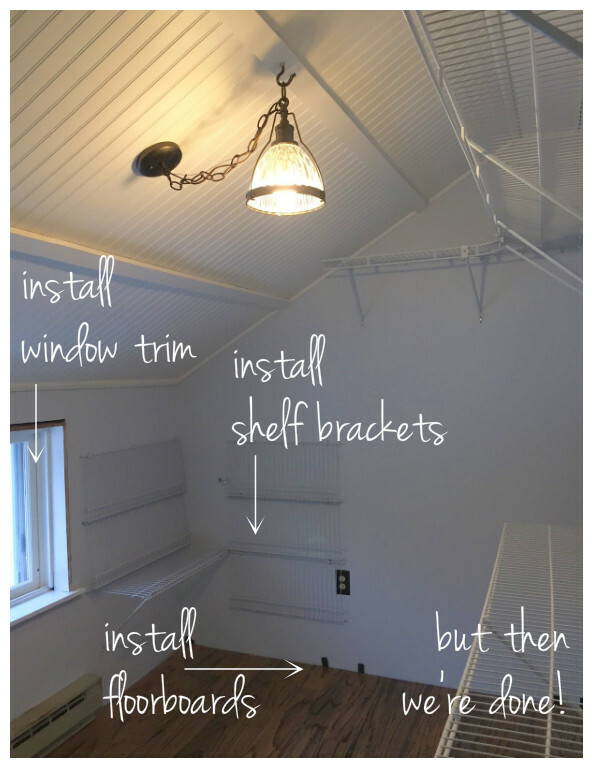 Then, we need to install the trim, install the shelving and install the flooring. I need a glass of wine just thinking about it. Wife, dog momma and lover of all things cozy. Here, I share our experiences renovating this 150 year old farmhouse that we love so much, and the memories we've made to make it the very happiest of homes.